Come and discover the Spanish caribbeans with the coolest scooter rentals at the best prices and discover the most incredible beaches you have ever seen! Formentera is the last paradise of the Mediterranean in the south of Ibiza with a long-lasting coast along which impressive cliffs and beaches of spectacular beauty are located, perfect for traveling by scooter. It is an island full of light and calm Mediterranean climate that allows enjoying its wonderful natural environment and its marvelous beaches. Plenty of the best coves in Formentera are quite difficult to reach, so renting a scooter gives you the freedom and agility to travel along more than 20 km of white sand beaches and crystal clear waters. Visit the beaches known as Cala Saona, Ses Illetes and Els Arenals in a unique, comfortable, easy and fun way. The Natural Park of Ses Salines (El Parque Natural de Ses Salines) is one of the most important attractions of the island that you should not miss. 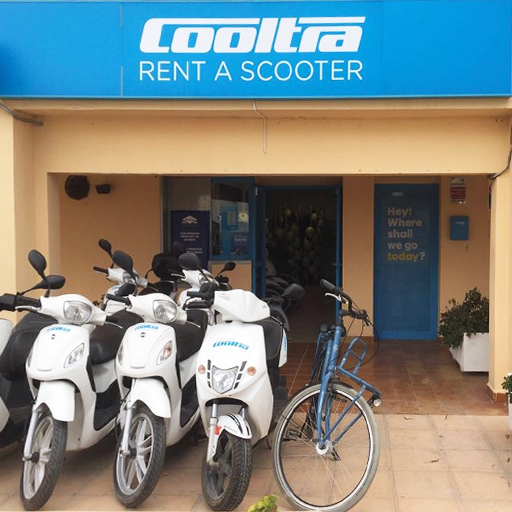 In Cooltra we take care of the environment and this is why with us you have a possibility of renting an electric scooter, benefiting from the following advantages: free entry ticket to the park, no gas bills and no queues at the gas stations. Further, if you are in Ibiza and want to make a trip to Formentera, do not miss our special offer of ferry to Formentera + scooter rental for a day. Our Cooltra team will help you with everything you need. We will do our best to make it easier discovering the island by giving you tips, suggestions, and recommendations to make the most of your vacation. Definitely, getting to know Formentera by scooter is very easy, with Cooltra you can make your reservation online, free cancellation and the best price guaranteed. In addition, we have extras available (top case, extra helmet, reduction of € 0 franchise, scooter delivery or pick up service etc.) to make the service fit your needs perfectly and get to make your trips safer, funnier and easier. You simply have to choose the store in which you want to make the reservation, the dates, select the scooter type, the extras you want and the bike will be yours. Do you have more doubts? Call us at (+34) 937066912 or email us via info@cooltra.com and we will ruin them. We have a gift for you. Get your ultimate Map of Formentera Island.